Aerovironment TurboCord DUAL, Level 1 & 2, 120/240 volt, 16 amp, 20′ cord, J1772 connector.. Please contact us for technical information or any questions you may have. At ZEROhomebills.com, we not only provide high quality EV charge equipment, but always provide our expert advice at no charge. Custom mounting solutions also available. TurboCord is the next generation of plug-in EV chargers. It’s ultra-compact size provides you the flexibility and freedom to take it anywhere. Just plug it directly into an outlet and charge at home, work or play. 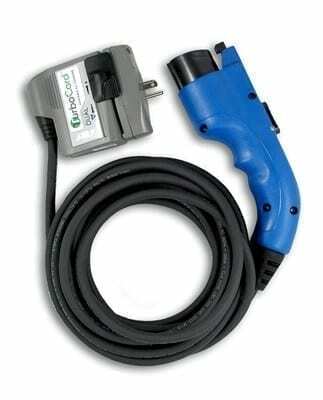 Aerovironment TurboCord DUAL, Level 1 & 2, 120/240 volt, 16 amp, 20′ cord, J1772 connector. . Please contact us for technical information or any questions you may have. At ZEROhomebills.com, we not only provide high quality EV charge equipment, but always provide our expert advice at no charge. Custom mounting solutions also available.